High volume recirculating fans maintain consistent, uniform temperatures required by MIL STD 883D while removing heat generated by the load. Rear wall is easily disassembled and removed to simplify fixturing of power leads or feed-through boards into oven. The PBC burn-in oven allows for traditional horizontal loading. Side to side horizontal airflow provides uniform atmosphere flow across horizontally positioned loads. Over-temperature protection control monitors maximum temperature and shuts off heater if set point is exceeded. Easy-to-use temperature controller featuring user-friendly arrow buttons for changing setpoints. The controller also contains programmable EZ-Keys enabling simple one-touch operation of repetitive user activities. Controller communication includes EIA 232/485 Modbus® RTU and supports network connectivity to a PC or PLC. 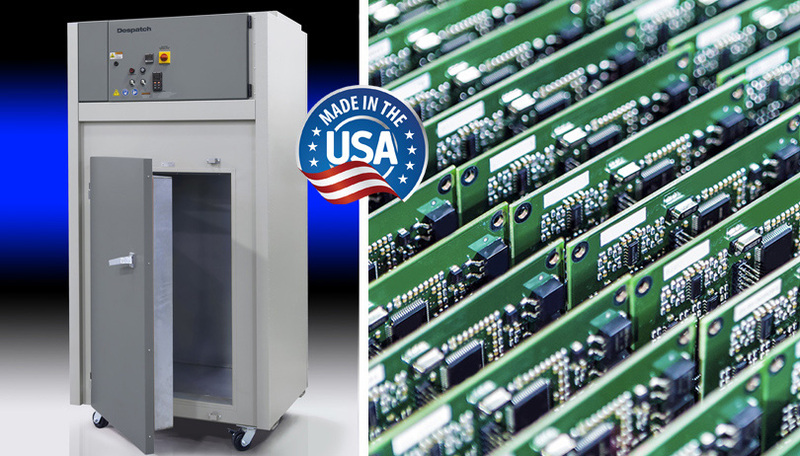 Power supply cabinet is a standard E.I.A. 19in (48 cm) cabinet and aesthetically matches the oven. 78in (198 cm) usable opening height. Increased dissipation allows increase in live load capacity without risking over temperature. Automatic damper controls amount of incoming fresh air while saving energy. Rapid cool-down provides faster cycle times. Back up/Redundant Hi-Limit to provide temperature protection in the event the primary device fails. Door switch to de-energize the heater and fan when the chamber access door is opened. Access port at rear of oven for test connections. Casters on bottom of unit for mobility. Traditional horizontal loading. Side to side horizontal airflow provides uniform atmosphere airflow across horizontally positioned loads. Over-temperature protection control monitors maximum temperature and shuts off heater if setpoint is exceeded. Easy-to-use temperature controller featuring user-friendly arrow buttons for changing setpoints. The controller also contains programmable EZKeys enabling simple one-touch operation of repetitive user activities.